Tracks in bold feature Steve Jones. 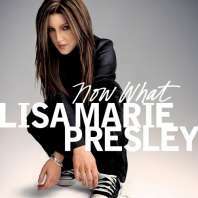 Steve makes two guest appearances on this new offering from Lisa Marie Presley. The album is US AOR rock, a genre that hasn't changed much in style since it flooded the American airwaves in the 80s following the advent of CDs. Tempered energy, angst ballards, it's the usual mix that neither challenges or offends you. However, the reason I'm reviewing the album is not for the general content, but for the two Steve tracks. With Steve devoting so much of himself to Jonesy's Jukebox, and his recorded appearances becoming rarer, has the boy still got the appetite to deliver? What do you think?!! The tracks, Idiot and the cover of the Ramones' Here Today Gone Tomorrow, hidden away at the end of the album, stand out like diamonds in a dungheap. The steady power chords on Idiot announce that Steve has arrived and is going to take you on a Jonesy ride for 4 minutes. Hearing him knock out the trademark sound we all love, made the hairs stand up on the back of my neck. The wall of sound is intact and in evidence. Lisa lifts her game and delivers the song in rock chick style, spitting out "You're an idiot and I hate your guts" over some slick harmonies. Even to the untrained ear, 'Idiot' is sonically so much better than the rest of the album, even the overall sound and production are at a different level. Maybe Lisa should have passed more of the album over to Steve? Here Today Gone Tomorrow is similarly paced to the original Rocket To Russia version, only with a more solid 'Steve' sound. It's a fitting nod towards Johnny Ramone. A Pistol paying tribute to a Ramone is a poignant reminder of the impact of both bands on rock & roll. A moving moment. So is the album worth getting? If you're hungry for some new product from the Steve Jones wall of sound, treat yourself. If you like the rest of the album, think of it as a bonus. All material ©1998/2005 Philjens/www.cookandjones.co.uk All rights reserved.